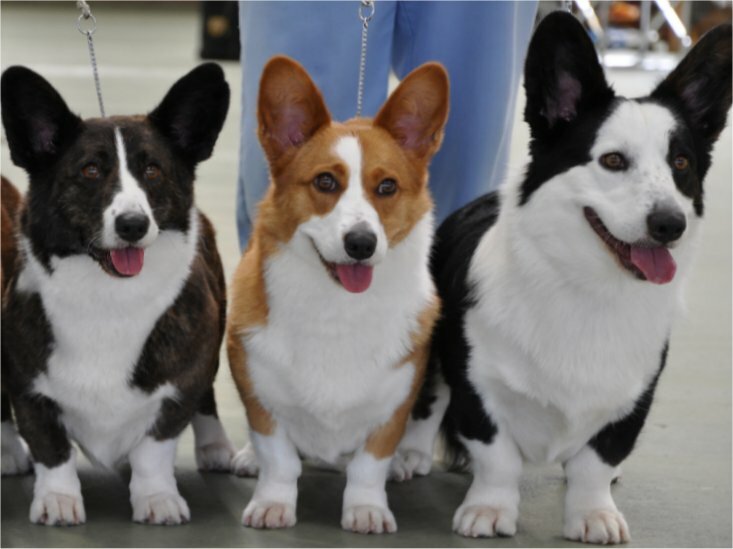 The Cardigan Welsh Corgi Front. Shoulders well laid, angulated at approximately 90 degrees to upper arm, muscular, elbows close to sides. Strong bone carried down to feet. Legs short but body well clear of the ground, forearms slightly bowed to mould round the chest. Feet turned slightly outwards. The moderately broad chest tapers to a deep brisket, well let down between the forelegs. Shoulders -slope downward and outward from the withers sufficiently to accommodate desired rib-spring. Shoulder blade (scapula) long and well laid back, meeting upper arm (humerus) at close to a right angle. Humerus nearly as long as scapula. Elbows -should fit close, being neither loose nor tied. 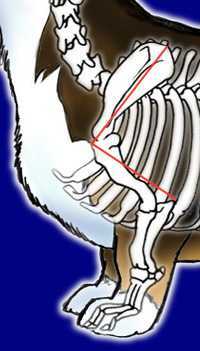 The forearms- (ulna and radius) should be curved to fit spring of ribs. The curve in the forearm makes the wrists (carpal joints) somewhat closer together than the elbows. The pasterns- are strong and flexible. Dewclaws -removed. The feet- are relatively large and rounded, with well filled pads. They point slightly outward from a straight-ahead position to balance the width of the shoulders. This outward point is not to be more than 30 degrees from center line when viewed from above. The toes should not be splayed. The correct Cardigan front is neither straight nor so crooked as to appear unsound. Overall, the bone should be heavy for a dog of this size, but not so heavy as to appear coarse or reduce agility. Knuckling over, straight front, fiddle front are serious faults. 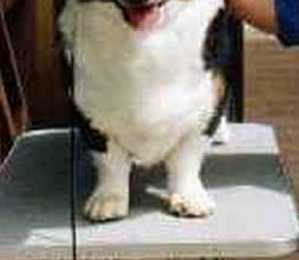 The forequarters of the Cardigan Welsh Corgi are an important breed feature. Cardigan fronts differ from all other herding/pastoral breeds and therefore require special consideration. 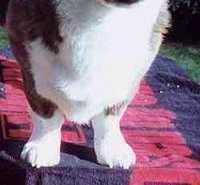 The forelegs of the Cardigan show a slight but distinct crook. Judges need to realize that this typical breed feature is an essential part of Cardigan type and along with the Cardigans wrap-around front, does not denote unsoundness in any way. For many years the term crook has been used by breed authors to describe the actual point where the bones (radius/ulna) exit from molding around the chest and move down into the pasterns, which themselves should be straight. The Cardigan was bred to work in the mountainous areas of Wales, and in the foothills and valleys surrounding them. The conditions encountered by the Cardigan Welsh Corgi in its working life could be harsh. This environment required a sound dog, with attributes of stamina and strength in combination with sufficient agility to negotiate rough, steep or marshy terrain efficiently. The correctly constructed Cardigan front, of adequate strength and angulation, without excessive turnout of the forefeet and built upon a correct, pear-shaped ribcage, was well able to cope with the conditions to be expected over its working life. As the front carries a large proportion of the weight of the dog and acts as a shock-absorber it is essential that it be strong and sound. From the side the shoulder should be well laid back (well angulated) to allow full extension of the stride and enable good reach. If too short, the upper arm will also restrict movement. the side, the whole front assembly should not be placed too far forward on the ribcage and the prosternum of the chest should be clearly visible. The standard requires the legs to be short, but to hold the body well clear of the ground. The forearms are not straight but instead mold closely to a deep chest, so that the pasterns are closer together than the elbows. There should be sufficient width across the chest so that the pasterns are not too close together. Overly exaggerated molding of the forelegs around the chest is wrong as is excessive foot turnout, which sometimes includes the pasterns as well as the feet. A true east-west front is equally as wrong in a Cardigan as in any other dog. From the side, the forearms should not appear bowed and should not be knuckled over. If viewed from above, the Cardigan forefeet turn very slightly outwards, ideally approximating the position of the hands on a clock stopped at 5 minutes to one. When viewed from the front, other visual cues for correct turnout are the inner lines of the pasterns, which should appear to be almost parallel to each other. Also, if an imaginary line was to be dropped from the elbow to the ground, it should only just touch the outer margin of the front feet. If there is too much turnout of the feet present, the outside edges will cross this imaginary line. Correct turnout should be confined solely to the forefeet and should not involve the whole of the foreleg pasterns. 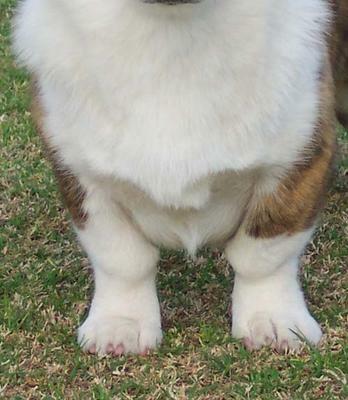 Corgis are genetically dwarf dogs. Their leg bones have not lengthened normally. The bow (or crook) of the forearm is the result of the radius growing longer than the ulna. If this is overdone, the elbow and or the pastern joints are damaged, and the whole front is deformed. The key to maintaining soundness is moderation. Cardigan breeders have to be careful not to overdo the bend in the front legs. However Cardigans which have correctly bowed fronts are fully sound. It must be stressed that the key word is *moderation*. Too straight a front is bad for one set of reasons and too bent a front is bad for another set of reasons, so somewhere in between is a front both correct and stylish, but most importantly, totally sound. Correct Cardigan feet should be rounded or even transversely oval in shape. Well padded, tight and with toes well arched. The hind feet are less rounded than the forefeet. Thin feet with long, flat toes frequently accompanied by poor bone are incorrect. Open, flat feet with splayed toes are totally wrong. Article on Radius Curvus by Dr. med. vet Daniel Damur, Switzerland. down to especially well shaped feet with slight turnout. note the correct wrapping of the radius/ulna around the chest. out of the feet is coming from the pasterns and not from the lower leg twisting. The feet are relatively large and rounded, with well filled pads."